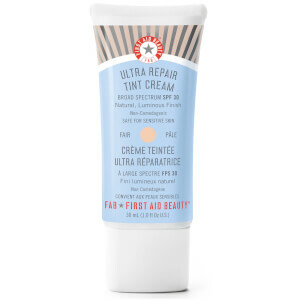 Achieve a smooth, flawless complexion with First Aid Beauty Ultra Repair Tint Cream; a tinted, multi-tasking formula that works to soothe, hydrate and protect, whilst minimising the appearance of imperfections. Fortified with Hyaluronic Acid, Colloidal Oatmeal and antioxidant Vitamin E, its whipped, mousse-like texture blends seamlessly onto skin to reduce the look of pores, redness and uneven skin tone. Natural mineral pigments are combined with finely-milled micro-pearls to enhance natural radiance and promote a luminous glow. Provides broad spectrum SPF 30 protection and 12-hour hydration. Fair: For pale, cream and fair skin. Light: For beige and buff coloured skin. Medium: For golden, olive or honey coloured skin. Tan: For caramel, tanned or medium brown skin. Rich: For almond, bronze or rich brown skin. Vegan. Allergy tested. Non-comedogenic. Suitable for sensitive skin. Free from alcohol, artificial fragrance, mineral oil, lanolin, talc, parabens, phthalates and sulphates. Apply liberally 15 minutes before sun exposure. Reapply: After 40 minutes of swimming or sweating. Immediately after towel drying. At least every 2 hours. Active/Sunscreen: Avobenzone 3%, Octinoxate 7.5%, Octisalate 5%, Octocrylene 7.5%. Inactive: Water/Aqua/Eau, Cyclopentasiloxane, Dimethicone, Cetearyl Alcohol, Cetearyl Glucoside, Potassium Cetyl Phosphate, Polyglyceryl-4 Isostearate, Dimethicone Crosspolymer, Tocopheryl Acetate, Glycerin, Cetyl PEG/PPG-10/1 Dimethicone, Cetyl Dimethicone, Polysorbate 60, Butylene Glycol, Hexyl Laurate, Colloidal Oatmeal, Phenoxyethanol, Sodium Dehydroacetate, Sodium Hyaluronate, Camellia Sinensis (White Tea) Leaf Extract, Carbomer, Tribehenin, Limonene, Tetrasodium EDTA, Aminomethyl Propanol, Citrus Nobilis (Mandarin Orange) Peel Oil, Allantoin, Sodium Ascorbate, Glycyrrhiza Glabra (Licorice) Root Extract, Chrysanthemum Parthenium (Feverfew) Extract. MAY CONTAIN: CI 77891 (Titanium Dioxide), CI 77492/CI 77499/CI 77491 (Iron Oxides), Mica.